I am so, so excited to launch my new blog design today! I've been working with Aubrey from The Kinch Life Designs on making this new look a reality for months and I couldn't be happier with the outcome. This outfit has to be one of my favorites and I was super excited to post it on the same day as my blog reveal! I fell in love with Space 46 Boutique the moment I saw the word 'tulle' and immediately had to get my hands on this blush, midi skirt. Not to mention this 'lovely' necklace from Brandy Pham. I mean, it couldn't be more appropriate + I'm in love with her everything in her line. Lighter colors with a hint of rose gold is the perfect combination for Valentine's day and definitely what I will be rocking when it comes time for Friday's date night with the hubs. One more fun announcement for this week--a lot of you have probably seen the sneak peak I posted on IG a few days ago of an amazing collab I've been working on with B is for Bonnie Design. This has by far been one of my favorite things to be a part of and I'm so proud of the print we created. The launch is all set for this Thursday, February 13th (just in time for v-day) and I just know you're going to love it. Stay tuned for more fun news on that later this week! Click HERE to see if you won the ABD mug giveaway. So pretty! Love that skirt with those heels! love that skirt. its so carrie bradshaw! What a sweet look this is, I am loving it. I'm a huge fan of a casual t-shirt and a fun skirt/pant. The mixing of the two styles makes for a beautiful look. What a fabulous valentine's look! You look awesome! I love love love your skirt! It's so chic! Hiii Saw spaceboutique's instagram of you and thought i would check out your blog! You have a lovely sense of style--very chic and romantic!! Simply beautiful! Love this look! So feminine, but provides you with the comfort a tshirt as well! So so so cute! Love it all! I LOVE it! That skirt is so perfect. I actually just bought a creme de la creme long sleeve top to wear with my tutu! 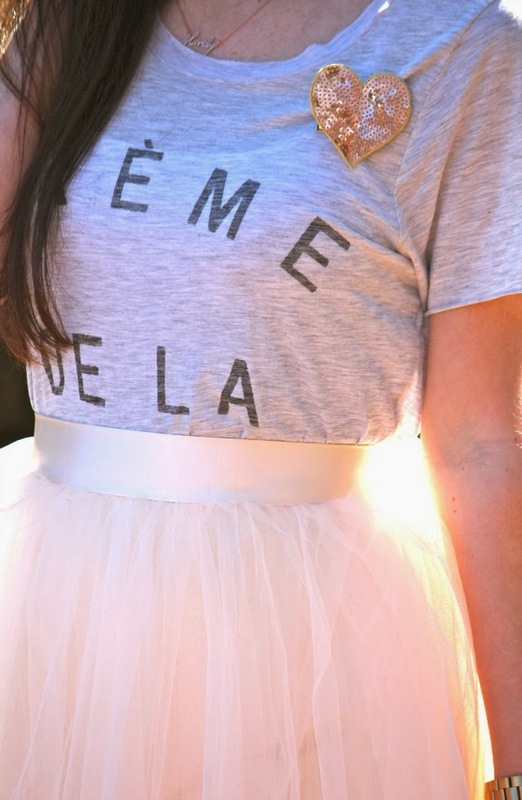 I'm obsessed with tulle skirts… I have to limit myself from buying them all! as I said you on IG, so amazing look, romantic and glamour! As I said you on IG, amazing romantic and glamour look!